1981 and 2017: What Can We Learn? 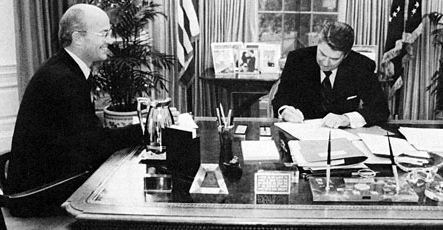 Secretary of Interior James Watt (at left) and President Ronald Reagan in 1982. Watt, a longtime critic of federal land management policies, was among Reagan’s more controversial cabinet picks. Photo by Mary Anne Feckelman, The White House. Image from www.usbr.gov. Despite the fact that I am a historian, I never really liked the adage that “Those who cannot remember the past are condemned to repeat it,” a phrase attributed to novelist and philosopher George Santayana. It is not that I believe history cannot inform the present – far from it – but rather that the notion of ‘repetition’ denies contemporary actors agency in their decision-making and disregards the incredibly contingent nature of so much of human life. The past is certainly there as a guide, resource, and yes, even a warning, but it is not a template. When I started writing this blog post, I could not have imagined what the last seven days would bring. My goal was to look back at the early days of the Reagan administration, when, after two decades of unprecedented action on the environment, a President and a Secretary of the Interior (among other appointees) were in place who vowed to undo much of the legacy of the 1960s and 1970s (ex. the Wilderness Act, the Land and Water Conservation Fund, Clean Water Act, National Environmental Policy Act, creation of the Environmental Protection Agency, Endangered Species Act, etc) Those who had worked countless hours to put these policies in place, as well as the millions who benefitted from them, were understandably apprehensive – as well as angry. Would the undeniable improvements in air and water quality as well as the (limited) progress on regulating chemicals and other hazardous substances be halted and then reversed? At present, we find ourselves in worrisome and, for many, perilous times. In a whole host of areas, civil liberties, healthcare, foreign policy and education, the future is, at best, uncertain. In regards to the environment, angst over what potential cabinet nominees could mean for climate change policy, the sovereignty of Indigenous peoples, public lands management and pollution control regulation (among other issues) is palpable among those concerned with the health of the planet. As I pointed out above, we can find echoes of some of these feelings in the 1980s, though, at that moment, we did not yet know how dire the climate crisis would become or how imperative immediate action on the issue would be. What lessons can we take from that history? Public employees can be quite influential and respected. We’ve already seen that in the “Alt NPS” movement and the excitement that various “rogue” twitter accounts have generated across multiple federal agencies. Incredibly important and vital grassroots movements take shape when more mainstream politicians or organizations may be slow to act. And finally, established groups focused on environmental or civil liberties will likely grow stronger as well as their missions become even more crystalized. There are many ways to get involved – but what is important is that we all became active participants in shaping our shared present and that we remember that the effects of government actions do not affect all equally and that vulnerable members of our communities need support. We are not condemned to repeat the past, but we can certainly learn from its lessons in order to build a more just, equitable future. 1. For more on the Reagan Administration and its environmental legacy see the following: A great recent blog post and article (scroll to the bottom for a link to the article) by Historian Jacob D. Hamblin available at https://jacobdarwinhamblin.com/2015/09/30/ronald-reagans-environmental-legacy/. Additionally, a few few length texts provide more background. These include: Hal Rothman’s The Greening of a Nation? Environmentalism in the United States Since 1945, Samuel Hay’s Beauty, Health, and Permanence: Environmental Politics in the United States, 1955-1985 and Robert Gottlieb’s Forcing the Spring: The Transformation of the American Environmental Movement. .